How Do Ocean Currents Move? There are a variety of factors that affect how ocean currents (water in motion) are created, including a combination of two or more factors. The different types of currents (referred to as surface or thermohaline, depending on their depth) are created by, among other things, wind, water density, the topography of the ocean floor and the coriolis effect. Wind is the single biggest factor in the creation of surface currents. Strong winds moving across an expanse of water move the surface of the water. These strong winds are not random breezes; the major winds that most often effect the creation of ocean currents are the Westerlies, which blow west to east, and the Trade Winds, which blow east to west. Another major factor in the creation of currents is water density, caused by the amount of salt in a body of water, and its temperature. 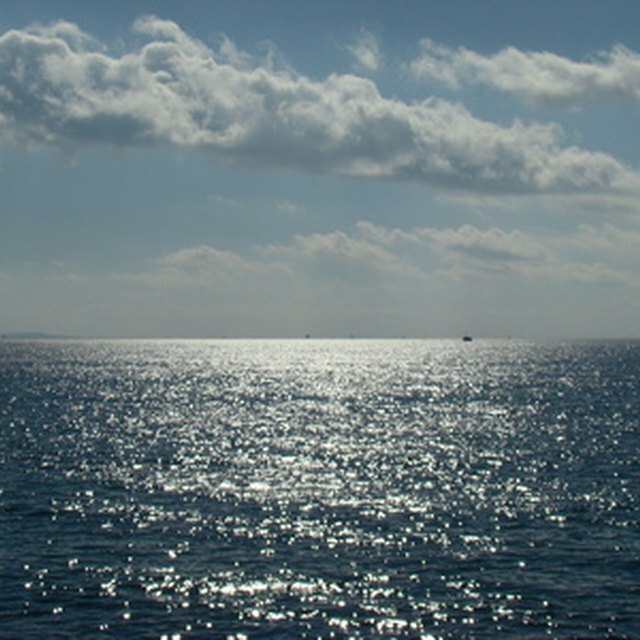 Water with a higher salinity, or colder water, is more dense and likely to sink. Sinking water pushes the water below it up. The combination of sinking and rising in the same area causes a current. Water contours to the topography of the ocean floor or bed. If the ocean bottom "drops out," like in a valley or trench, the moving water will move downward. If there is a rise in the ocean bottom, like a ridge or mountain, the water moving along it will be forced upward. The sudden upward or downward change of direction causes water displacement, creating a current. When a rotating object collides with another moving or stationery force, it creates a new motion. The Earth's rotation creates two currents: one, a clockwise movement of water in the Northern Hemisphere; the other, a counter-clockwise movement of water in the Southern hemisphere. When these currents are deflected by land masses, they create huge ocean currents called gyres. Ashe-Edmunds, Sam. "Four Factors That Create Ocean Currents." Sciencing, https://sciencing.com/four-factors-create-ocean-currents-5997662.html. 13 March 2018. Why Is Hot Water Less Dense Than Cold Water?